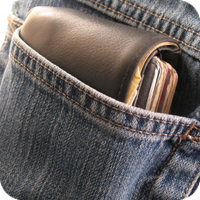 Most men carry a wallet in their back pockets and in many cases it can be over a half an inch thick. Sitting on a half inch wedge for hours at a time over a period of years is one of the most overlooked causes of spinal misalignments and spinal pain including back pain, neck pain and even headaches. Our recommendation is to clean out your wallet and carry only what is really necessary. An innovative new product that has a unique patented designed and can reduce the size of your wallet by over 50% is called the TPK Back Saver Wallet, we like to think of it as The Wellness Wallet. Its unique thin design allows for it to be carried in your front pocket instead of your back pocket restoring the natural tripod effect of your spine when you are seated. You'll be amazed at what a difference it makes. Sign up below or call us at 516-579-4949! "Dr. Bernstein's care and knowledge have been great. Over the course of a treatment he helped me with headache and tension issues and gave me great exercises i could do outside the office to help strengthen my upper and lower back."